If you haven’t already noticed I love using fresh herbs in my cooking. The flavor is unbeatable and takes your home made dishes to a whole new level. With summer around the corner fresh flavors are what we are all craving. Why not spice up your meals with a sprinkle of chives, basil, thyme or mint? This is my first installment of what will hopefully turn out to be a fruitful series on home grown herbs. How to grow, harvest, and use these potent plants to enhance your cooking and way of thinking. Keep in mind this is based on my experiences, I am by no means a botanist or herbalist. growing indoors along a window where you get a fair amount of sunlight. 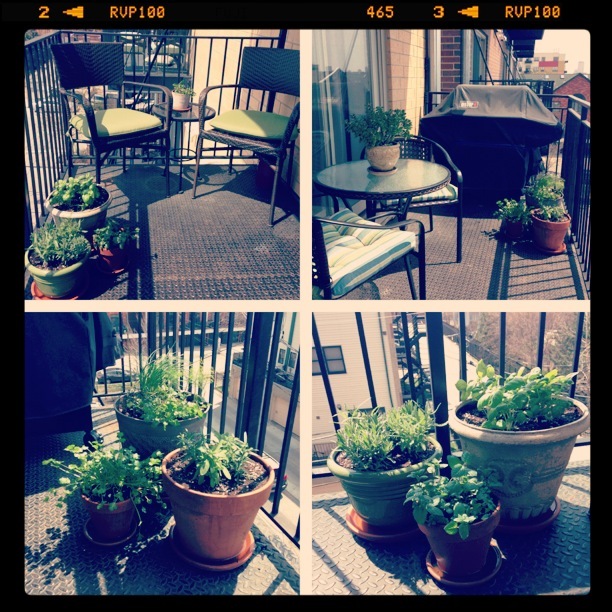 A few shots of our balcony herbs last year. I have to grow my herbs in pots as our outdoor space is a metal balcony, 4 stories off the ground. When I think about it this is actually an ideal arrangement (or at least that is what I tell myself) for several reasons. First, I can easily move my herbs indoors when the weather gets cold to maintain and use for the winter. Second, most herbs are actually weeds and spread like wildfire. 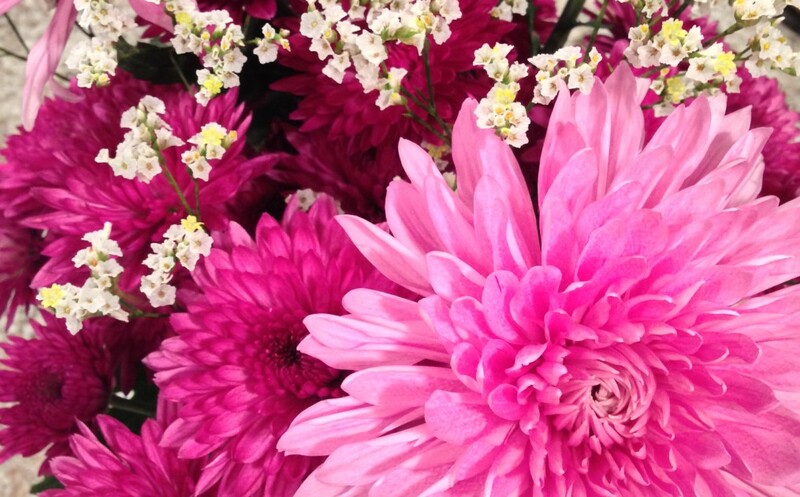 When they are contained in a pot, you can keep control of growth. Last but not least, I can move the pots around to redesign our outdoor space easily. 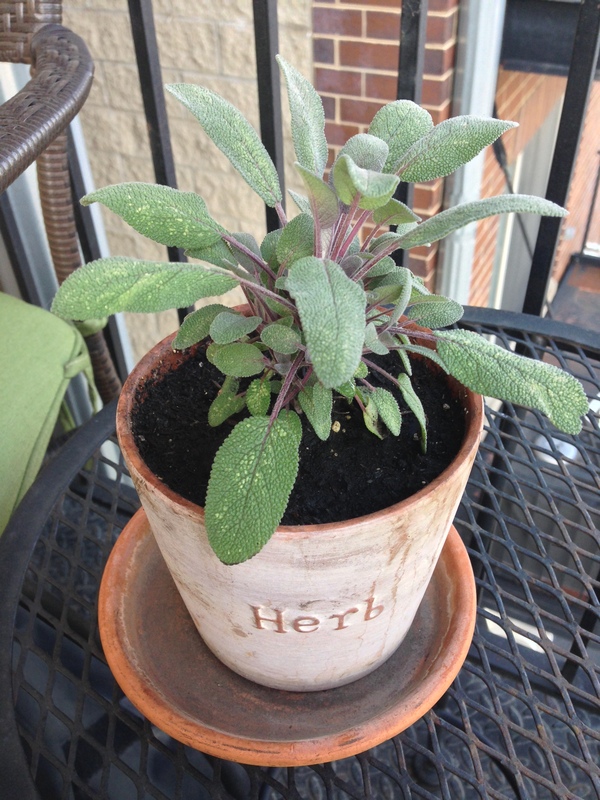 Once you decide on the herbs you want and get your starter plants home, you need to pick out a good pot. Beyond basic aesthetics you want to have a pot that has a hole in the bottom to allow excess water to drain. If the water can’t drain from the pot you run the risk of the roots being too wet and molding = yellow dying plant. Keeping a plate under the pot will keep it from making a mess when you water. I use a few different styles of pots, but always go back to the trusty and cheap clay pots pictured below. Make sure the pot is big enough as well, you want the roots to have room to grow as your plant grows. I try to pick a pot that will be about as large as the plant itself when it is full grown. Bigger is better. Prepare your pot by putting a few rocks on the bottom to assist with water drainage and to keep the soil from falling through that nice hole in the bottom. Now for the soil. I use a standard potting soil that comes with fertilizer that claims to feed the plants for up to 9 months. This is where people get creative. I have heard of mixing in egg shells into the soil, peat moss, news paper, vegetable peelings, coffee grounds, the list goes on and on. I can see the merit in this, but to be honest I’m not that intense. Fill your pot 3/4 of the way full with soil, take your starter plant out of the tray and make a little hole large enough for the bulb. A little trick I learned is to breakup or unwind the roots after you pull it out of the tray. The idea here is that the roots in the tray are typically wrapping around in a circular motion that if not broken from this growth pattern can eventually strangle the plant as the roots continue to grow in this direction. You want the roots to spread out into the new space you are providing, so loosen them up to let that happen. With your new plant in the pot, fill in any spaces left with soil making sure to leave a little space between the top of the soil line and the top of the pot. You will appreciate this extra space when you water. Gently pat the soil down, be careful not to pack to hard. Now you want to water, water, water your new plant to let it settle and start to grow! 1.You have to water them pretty much daily (I water first thing in the morning). The reason is that these pots are of a confined space so there is only so much soil and so much saturation. Growing plants need a lot of water to not only survive, but thrive. You don’t have to worry about over watering, as the excess water will run out the bottom. Keep in mind these pots will get hot in the sun and water in the soil will readily evaporate further depleting your roots from water. On hot days, you will want to consider watering twice a day. I know, needy little suckers. 2. Fertilize your plants with some sort of supplement, I use miracle grow powder that I add to the water every two weeks. You want to keep the soil nutrient rich to give your plants what they need to stay healthy. Yellowing leaves or loss of vibrant color is typically a sign that you need to fertilize. 3. Use your herbs! When you cut your herbs back for use they come back two fold with new growth and you keep maturation at bay so the plant doesn’t go to seed. With most herbs, there is a right and wrong way to harvest them…we will cover this further as the herb series continues. The summer is just starting and I’m sure I’ll find a few more plants I want to have around, like tarragon and oregano…if only I can find the space! Let me know what you have growing!